Mission 500 has received over $18,000 in donations at two recent U.S. industry events thanks to the support of kindhearted donors, partners and generous sponsors in the security community. The donations from these two events bring this year’s total to $507,000. 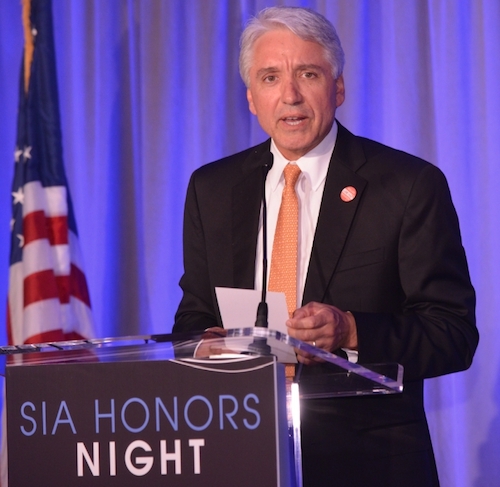 The funds, raised at the SIA (Security Industry Association) Gala in New York City on November 18 and at the Miami Mixer on December 2, will help support children in need, both locally and internationally, through World Vision. World Vision, Mission 500’s parent entity, is a non-profit organization dedicated to helping children, families and their communities worldwide by tackling the causes of poverty and injustice. For the second year in a row, Mission 500 was invited to partner with SIA for their annual Gala. This year’s honorees included the late Frank De Fina, Ray Coulombe, and Ray O’Hara. More than 200 security professionals attended the event where Advisory Board Chairman, Alan Forman and Advisory Board Member, George Fletcher both spoke on behalf of Mission 500, specifically on the continued need to help children and families in financial distress in America. The Miami Mixer featured a toy shoe box build and, to cap off the evening, a performance by Biana Pinchuk, the twelve year old world-renowned musical prodigy. The event was the second held by the Miami Committee which formed in 2014. In addition to participating in and raising money for these and other Mission 500 events, security industry professionals can support Mission 500 in a variety of ways, including volunteering to help with the Security 5K/2K or making financial donations. All donations are tax-deductible and can be made with major credit cards and American Express loyalty points.